The following is a guest post about estate planning. If interested in submitting a guest post please read my guest post policy and then contact me. When planning for retirement there are a lot of things to consider such as investment options, pension, financial plans, etc. 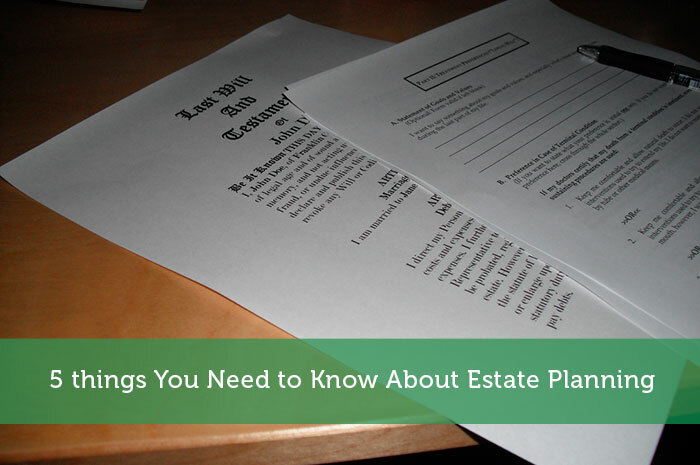 With so much to consider many people forget a crucial component-estate planning documents. Currently 60% of Americans do not have their Last Will and Testament in order. This means that many families will have to deal with the government in order to receive their inheritance. It can put your family in stressful situations that you never intended to place them in. For instance, if you pass away without a Will the government decides how to split your assets between your loved ones. Some states only give one third to one half to a spouse which may result in them not having enough money to live. Creating a Last Will and Testament not only communicates your wishes regarding your estate but it ensures your loved ones are looked after. Once you have created your Last Will and Testament , it is important to update after certain events to keep it valid. To make simple changes to the Will, change your executor or guardian you can use a Codicil. Codicil is a document that modifies deletes or adds to the content of an existing Will without having to rewrite it. However certain situations such as marriage, divorce, changing beneficiary and having more than one Codicil attached, require you to create a brand new Will. When creating estate planning documents many people think it just includes a Last Will and Testament. This is untrue as having a Health Care Directive and Power of Attorney is just as equally important. Health Care Directive combines a Living Will and a Medical Power of Attorney together. This document allows you to communicate your choices for medical treatment and appoint a person to make healthcare decisions when you are no longer able to. Power of Attorney allows you to appoint a person to look over your financial affairs. This allows the person for example to manage your property when you no longer can. You can also specify the type of power and duration you wish to give. Estate planning documents require you to select someone to carry out your requests on your behalf when you are no longer able to. It is important to remember that when appointing someone for these legal documents you must trust them completely as they will be dealing with your financial and health care decisions. Ensure that you go over these documents with them so they are aware of their responsibility and your wishes. Last Will and Testament requires you to select an Executor. An Executor will file your Will at the probate office, identify assets, pay expenses and hand out the inheritance in accordance to your wishes. Healthcare Directive requires you to select a Health Care Agent. A Health Care Agent will make health care decisions for you when you are no longer capable of making them for yourself, or if you are unable to communicate your decisions to others. Power of Attorney requires you to select An Attorney in Fact. An Attorney in Fact will deal with your financial and legal affairs, make decisions and keep accurate financial records. Place your estate planning documents in a safe place such as a fire proof cabinet. Let your Executor, Agent and Attorney in Fact know the location and have access to the documents. They may need to grab them at any time and without prior location knowledge or accessibility it can cause serious delays. Author Bio: LawDepot is the leading publisher of do it yourself legal documents and omits unnecessary legal fees. With over 10 years’ experience, LawDepot has helped its customers save half a billion dollars. LawDepot’s easy step by step questions allow you to create any legal document within minutes! Visit LawDepot to get started on your legal document today. Well, not surprisingly, many states want a piece of the estate revenue action, too. So, though you may not be concerned about federal estate tax, your estate may have to chip in to state coffers. My understanding was that in virtually all states marital assets passed directly to the spouse, and that virtually all assets in a marriage are classified as marital assets? Is this not correct? If it is correct, then the state only has power of assets that are not part of the marriage and dieing without a will would not impact the asset division among relatives. Am I missing something other than a concise way of putting this? This was a great reminder that I really need to sit down and write out a will. Great idea about letting your executor know where to find these papers. When the time comes, many people will not be in the right state of mind to be thinking clearly. Great article on things that all people should know about estate planning. The trust issue is something that should never be taken lightly when making a plan. Advance directives and a durable power of attorney are sometimes more vital than a will because they affect someone while they are still alive. Agree with the importance of reviewing. We would usually advise to review your Will every 3-5 years as well as whenever your circumstances change to account for changes to legislation.